$19.99 to $169.99 & FREE Shipping on orders over $59 $35. A synthetic cork with the ability to last 4 years plus. Supercorks are manufactured in Italy by Enolandia. One of the very first companies to make a synthetic cork, they have a history of quality since the 1980's. Supercorks have been tested to keep their elasticity and sealing integrity for at least four years. This makes them a nice alternative for winemakers who want to eliminate the potential issues of porosity or TCA contamination inherent in cheaper natural corks but also want the ability to age wine more than a few years. This cork measures 23x43mm. Chemical details: Polietilene, Food pigments, Food expanders. Lubrication: Silico-paraffinic solution. No solvents. Preservation: Corks should be kept away from any possible contact with liquids and odors. Keep at temperature of 18-25° C especially in the summer season. Certification: Corks comply with antitoxic certificates from public authorities. Meets European standards and FDA. Follows CEE directive 85/572-89/109-90/128. This cork will last significantly longer than most natural corks. If the cork is heated in warm water, it makes for an easy bottling process. I chose these corks because of their estimated longevity, 4 +years. 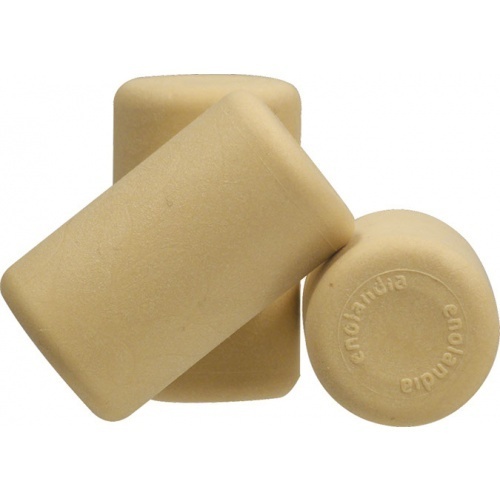 These synthetic corks are much more durable than their natural counterpart option. I've had these corks in bottles for four to five years with no problems. The trick to bottling with these corks is to heat them in warm water (130 degrees or so) for about 10 minutes to make them more pliable for compression and insertion by the corker.